As you know, the Report of the Special Investigators from Mike Bowers and Richard Hyde to DeKalb County iCEO Lee May was released late last week. My bottom-line is this: every dollar discussed in this report is a taxpayer dollar – it is all your money. This is not the county government’s money or Monopoly money, this is money a taxpayer in DeKalb worked hard to earn. As a result, every dollar must be respected. *I want to hear from you, the taxpayers of DeKalb County, about this report and any ideas, thoughts, or recommendations you might want to share with me. *I invite you to e-mail me at nancy@nancyjester.com with anything you want to share. *I welcome input from all parts of DeKalb County, I want to hear from everyone who wants to share. The Special Investigators have called on iCEO Lee May to resign, I am interested in your thoughts on this matter. Additionally, there is the question of both the legality and appropriateness of spending by several elected officials and county managerial employees. I welcome your thoughts and concerns about the reported expenditures. These are dark days for DeKalb County. But I remain confident there are better and brighter days ahead. I want to reaffirm my confidence in the vast majority of your DeKalb County employees, most are good and decent people who work hard and lawfully every day to serve you. I also want to reaffirm my commitment to hold those accountable for any illegal activity and to do all I can to return DeKalb County government to a level of professionalism and competency of which you may be proud. Thanks for taking a moment to share your thoughts, ideas, and recommendations. I want to thank you for announcing a series of Town Hall meetings to, as you describe them, discuss your Executive Order and the release of the report. 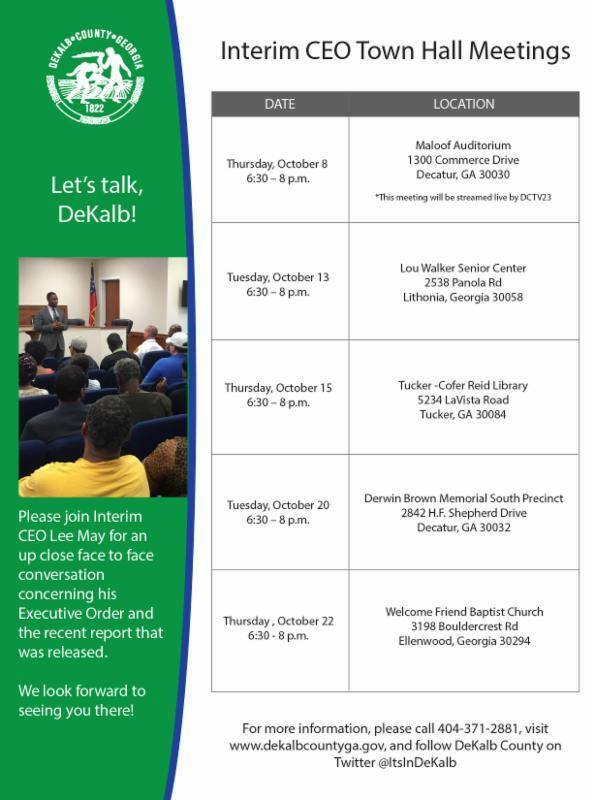 I have received communications from a large number of DeKalb County taxpayers who have observed there is no Lee May Town Hall currently announced in the north-west part of DeKalb County. I have been in touch with taxpayers in both Dunwoody and Brookhaven. I have been asked to invite you to hold two additional town halls, one each in Dunwoody and Brookhaven. I have been assured that securing an appropriate public meeting location will not be an issue in either community. I am at your service to assist you, in any manner, to make town halls in Dunwoody and Brookhaven a reality. I know you share with me a deep respect for the taxpayers of DeKalb County who reside in Dunwoody and Brookhaven and look forward to your announcing you will have “up close face to face conversations” with these DeKalb County stakeholders in the same time frame as you are in much of the remainder of DeKalb County.